Nicest apartment in the building, with a large and sunny terrace accessible from both the living room and the master bedroom. 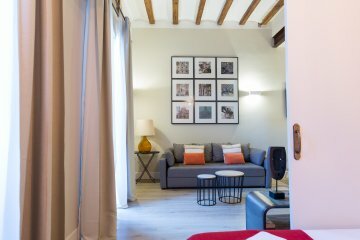 Stylish newly renovated and carefully furnished three bedroom apartment: one very comfortable and cosy master bedroom with queen size bed, huge bathroom, desk corner a closet. The other two bedroom have both twin beds and access to the second bathroom located in the corridor next to the living room. The open kitchen creates a very special ambience in the large living room, whith very high ceiling and lots of small details to make you feel as if you were at home. Asditional services include wifi, air conditioning in all the apartment. The building where the apartment is located is very modern and only dedicated to this type of accommodation. Closest metro stop is SANT ANTONI (L2) or POBLE SEC (L3). 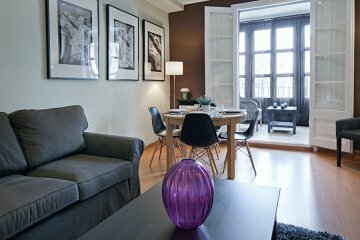 City centre is walking distance from the apartment, Las Ramblas is only 10 minutes away from the apartment.